Our beloved May Court Nearly New Shop celebrated 60 years of serving the community in March. Like all good parties, we celebrated with cake, balloons, prizes and special draws! We would like to take the opportunity to tell you just what it takes to run a consignment shop for 60 years and counting! Did you know our shop is completely volunteer run? Yes, it is, and 100% of the net proceeds benefit the community through The May Court Club of Oakville researched and approved programs & charities in the Halton Region. Over 100 May Court volunteers take part in the day to day running of the shop. That includes taking in & tagging consignment items, cashing customers out, working the floor, stocking the racks, creating our beautiful window displays, computer operations, schedulers, and someone who manages our supplies. Our Shop Committee includes the Shop Director, Treasurer, Marketing & Communications, Shift Supervisors & more! As you can see, it takes a village! We are thrilled to be a shopping destination to score great deals on clothing, accessories, home décor and small housewares. Our customers become regulars, and some have been known to travel from other provinces with an empty suitcase! We have a range of clothing that includes high-end designers & great quality clothing, including one of a kind & vintage pieces. All are priced to sell, and nothing stays in stock long. Our inventory changes daily, even hourly! Yes, we love helping our customers score a deal, but we also love that we serve a need within the community as an affordable place to shop. Top those reasons with the fact that consignment shopping is also environmentally friendly, we know we have a winning combination. We could not have managed our success without our volunteers who love volunteering. Some have been volunteering there for over 30 years, and all have made great friends with their fellow shift mates. Our clients also have longevity with the shop. Some of our customers have even become May Court Members. Not only are we a well-priced store, but we are also the best deal for consigning your items. We offer a 50/50 split. That’s more than what other consignment stores offer. We have smart, savvy and community minded clients. Our clientele like knowing that the profits from their consigned or donated items will go to toward their fellow neighbours, children, seniors, and those struggling with mental health & more. May Court helps multiple organizations and have been doing so since 1956! We plan to continue to be a source of charitable revenue for the community for another 60 years and look forward to doing so with all our customers and volunteers along for the ride. Thank you for a wonderful 60 years! Here’s a sample of our volunteers modelling some clothing. 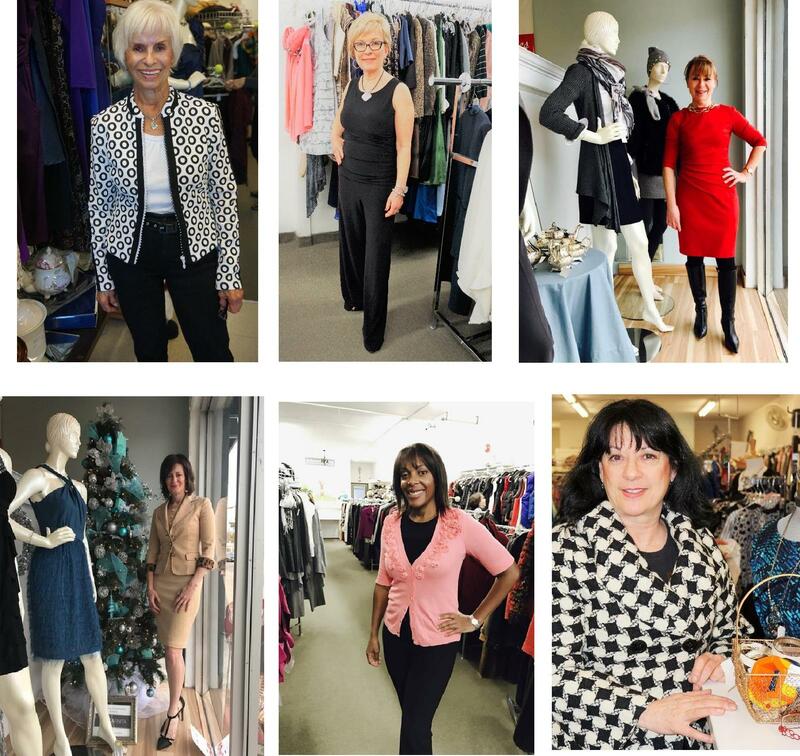 Please stop by our shop at 200 Kerr St. in Oakville to get some new fabulous finds & help support your community!